Tear down the hair-raising 8.5-mile-long (14-km) rapids of the Koprulu Canyon on a wet and wild adventure in the Koprucay Canyon National Park. 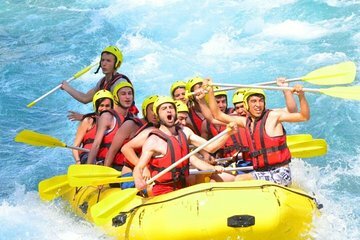 This full-day white-water rafting tour includes transfers from Kemer, a picnic lunch by the waterfront and full instruction, so the whole family can take part. during the canyoning my fiancee had asthma attack so we needed her inhaler urgently and i informed the tour guide which apparently didn't give any attention at first then he kept telling me that we will finish the canyoning in 5 min and we will meet the bus which contains our belonging which was all lies as we finished 50 min later and when we finished the canyoning there were no bus and he told us that we have to walk for the rafting , at this point i was so upset and frustrated as my fiancee needed the inhaler so he told me that the bus will meet us at the rafting place and we can take the inhaler , after 25 min walk at the rafting place there were no bus and a man came with the inhaler which obviously have went through our stuff to search for it !!!!!!! !